Speakers included Mayor Celia Wade-Brown, Maanu Paul from the Maori Council, Professor Jane Kelsey from the University of Auckland, Dr Geoff Bertram from Victoria University of Wellington, BERL Chief Economist Ganesh Nana, Justin Duckworth the Bishop of Wellington, Peter Love from Te Atiawa, and his granddaughter Kaia Love, and representatives from Greenpeace and Grey Power NZ. Musical interludes were provided by Tribal Rizing, Lucky Ngauere and guests. 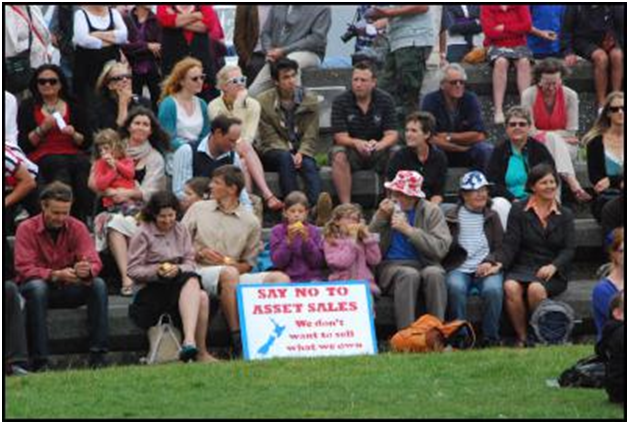 A wide variety of arguments against the government’s proposed assets sales were put forward by the speakers, addressing the issue in ethical, political, economic, ecological and social terms. Across the range of speeches, clear lines were drawn between partial privatisation and the economic problems facing ordinary New Zealanders; the range of knowledge and variety of approaches was a powerful counter to the government position.